The Mughal Empire, (Persian language: مغل بادشاۿ) was an empire that at its greatest territorial extent ruled parts of Afghanistan, Balochistan and most of the Indian Subcontinent between 1526 and 1857. The empire was founded by the Mongol leader Babur in 1526, when he defeated Ibrahim Lodi, the last of the Afghan Lodi Sultans at the First Battle of Panipat, where they used gunpowder for the first time in India. The Mughal Empire is known as a “gunpowder empire.” The word "Mughal" is the Indo-Aryan version of "Mongol." Babur was a descendant of Chingis Khan. The Mughals retained aspects of Mongol culture well into the sixteenth century, such as the arrangement of tents around the royal camp during military maneuvers. The religion of Mughals was Islam. Under Akbar the Great, the empire grew considerably, and continued to expand until the end of Aurangzeb's rule. Jahangir, the son of Akbar, ruled the empire between 1605 and 1627. When Shah Jahan, Jehangir's son, became emperor in October 1627, the empire was large and wealthy enough to be considered one of the greatest empires in the world at that time. It was Shah Jahan who commissioned the building that represents the pinnacle of Mughal architectural achievement, the Taj Mahal, between 1630 and 1653. Sponsors of art and of learning, the Mughals left a rich heritage of buildings, paintings and literature. Their beautiful gardens (jahanara) representing a taste of heaven on earth, and the sanctity of nature which in the Qur'an praises God (Q34: 10), remain an impressive part of their heritage. After Aurangzeb died in 1707, the empire started a slow and steady decline in actual power, although it maintained all the trappings of power in the Indian subcontinent for another 150 years. In 1739 it was defeated by the army of the Persian shah, Nadir Shah (1688-1747). In 1756 Ahmad Shah (1747-1772) of Afghanistan looted Delhi. Complacent in their military superiority, the Mughals failed to modernize their technology. While no Indians could challenge their cannon, outsiders could. Increasingly, the Mughal emperors grew less interested in good governance and more interested in maintaining their lavish lifestyle and expensive court. Hence, the emperors up to Aurangzeb are called the “greater,” after him the “lesser.” This is very similar to the pattern that emerged in the Ottoman Empire, where the rulers grew increasingly disinterested in good governance and repeated the pattern of their predecessors, the Afghan Lodi Sultans. Maintaining the Mughal lifestyle meant higher taxes, from which the taxpayers derived no benefit. Little money was invested in agricultural or technological development. Economic prosperity was regarded as a threat to the security of the state, and so was discouraged (the more wealthy people could purchase arms and rebel). Local governors took advantage of this to virtually declare independence from the center, soon aided and abetted by the British and French. Under an initial treaty with the Mughals in 1616, the British first built factories; by 1765 in the Treaty of Allahabad they acquired tax raising and administrative power in Bengal, Bihar and Orissa, after which the Mughal emperor became their puppet. They dissolved the empire in 1857, having already gained control of substantial territory in India, winning the competition against the French and Dutch. At times, the Mughals experimented in establishing good inter-religious relations with the non-Hindu majority, employing Hindus in senior posts. At other times, religious zealousness resulted in the destruction of temples and of Hindu images and in the imposition of harsh taxes. The positive aspect of their legacy still contributes to interfaith harmony in India, Pakistan and Bangladesh, but the negative aspect fuels inter-community (communitarian) hatred and even violence. Lessons can be learned from the Mughal legacy on how to govern multi-racial, multi-religious societies. The Mughal ruling class was Muslim, although many of the subjects of the empire were Hindu and also Sikh. When Babur first founded the empire, he did not emphasize his religion, but rather his Mongol heritage. Under Akbar, the court abolished the jizya, the tax on non-Muslims, and abandoned use of the lunar Muslim calendar in favor of a solar calendar more useful for agriculture. One of Akbar's most unusual ideas regarding religion was Din-i-Ilahi (“Godism” in English), which was an eclectic mix of Hinduism, Islam, and Christianity. He enjoyed good relations with the emerging Sikh community, and it was proclaimed the state religion until his death. These actions were later retracted by Aurangzeb, known for his zealotry. Aurangzeb imposed Sharia law, which he codified, re-imposed the jizya, and as had Babur, destroyed temples in order to build mosques. He is known to have treated non-Muslims harshly. Under Aurangzeb, Mughal court life changed dramatically. According to his interpretation, Islam did not allow music, so he banished court musicians, dancers, and singers. Further, based on Muslim precepts forbidding images, he stopped the production of representational artwork, including the miniature paintings for which the Mughals are renowned. The Mughal Emperors persecuted several of the Sikh Gurus, and Jehangir executed the fifth Guru. Even the Taj Mahal is reputedly built on a sacred Hindu site, although this is disputed. At times, popular Sufi teachers such as attracted Hindu and Muslim disciples while some Hindu gurus were also popular among Muslims. Many Sufi shrines are still visited by Hindus as well as Muslims. The Mughals tended to regard themselves as rulers by divine right, rather than as subject to Islamic law. Thus, they did not afford religious scholars much authority. Although they recognized the Ottoman claim to the title of caliph, they saw the Ottomans as just another Muslim empire like themselves, especially as they shared a similar pedigree. Whether the earlier policies of harmonizing religions were merely pragmatic or stemmed from a more inclusive understanding of Islam is debatable. Certainly, such Sufi teachers as Kabir (1414-1518) who flourished at an earlier period had represented a 'peace to all' type of Islam that was attractive to many people in the subcontinent. He taught that all people are members of one family and he drew equally on Muslim and Hindu devotional traditions. The reversal of the early policy would eventually result in the partition of India based on the “two-nation theory,” which believed that Muslims and Hindus were two nations and could not peacefully co-exist. 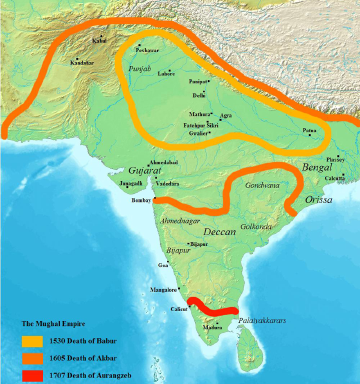 The Mughals used the mansabdar system to generate land revenue. The emperor would grant revenue rights to a mansabdar in exchange for promises of soldiers in wartime. The greater the size of the land the emperor granted, the greater the number of soldiers the mansabdar or Zamindars had to promise. The mansab was both revocable and non-hereditary; this gave the center a fairly large degree of control over the mansabdars. 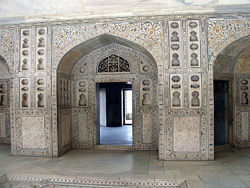 As a result of increasingly heavy taxation (initially the Mughals had not overtaxed), revolt was encouraged as local people objected to the amount of money spent on the lavish Mughal court. Initially, this also encouraged economic development, establishing a strong system of banking and credit, and issuing paper money. Increasingly, however, they bled the country of its wealth to feed their lifestyle. Ignoring development, they failed to keep pace with the developments of the rest of the world, including those of weapon technology. In the early sixteenth century, descendants of the Mongol, Turkic, Persian, and Afghan invaders of Southwest Asia—the Mughals—invaded the India under the leadership of Zahir-ud-din Mohammad Babur. Babur was the great-grandson of Timur Lenk (Timur the Lame, from which the Western name Tamerlane is derived), who had invaded India and plundered Delhi in 1398 and then led a short-lived empire based in Samarkand (in modern-day Uzbekistan) that united Persian-based Mongols (Babur's maternal ancestors) and other West Asian peoples. Babur was driven from Samarkand and initially established his rule in Kabul in 1504; he later became the first Mughal ruler (1526–30). His determination was to expand eastward into Punjab, where he had made a number of forays including an attack on the Gakhar stronghold of Pharwala. Then an invitation from an opportunistic Afghan chief in Punjab brought him to the very heart of the Delhi Sultanate, ruled by Ibrahim Lodi (1517-26). Lodi's own uncle invited Babur to invade, because the Sultan was weak and corrupt. Babur, a seasoned military commander, entered India in 1526 with his well-trained veteran army of twelve thousand to meet the sultan's huge but unwieldy and disunited force of more than 100,000 men. Babur defeated the Lodi sultan decisively at Panipat (in modern-day Haryana, about 90 kilometers north of Delhi). Employing gun carts, movable artillery, and superior cavalry tactics, Babur achieved a resounding victory. A year later, he decisively defeated a Rajput confederacy led by Rana Sangha. In 1529 Babur routed the joint forces of Afghans and the sultan of Bengal but died in 1530 before he could consolidate his military gains. He left behind as legacies his memoirs (Baburnama), several beautiful gardens in Kabul and Lahore, and descendants who would fulfill his dream of establishing an empire in the Indian Subcontinent. When Babur died, his son Humayun (1530–56) inherited a difficult task. He was pressed from all sides by a reassertion of Afghan claims to the Delhi throne, by disputes over his own succession, and by the Afghan-Rajput march into Delhi in 1540. He fled to Persia, where he spent nearly ten years as an embarrassed guest at the Safavid court of Tahmasp I. During Sher Shah's reign, an imperial unification and administrative framework were established, but would be further developed by Akbar later in the century. In 1545 Humayun gained a foothold in Kabul with Safavid assistance and reasserted his Indian claim, a task made easier by the weakening of Afghan power in the area after the death of Sher Shah Suri in May 1545, and took control of Delhi in 1555. However, he was not in power a few years before he took a fatal fall down his library's stairs. Humayun's untimely death in 1556 left the task of further imperial conquest and consolidation to his 13-year-old son, Jalal-ud-Din Akbar (reigned 1556–1605). Following a decisive military victory at the Second Battle of Panipat in 1556, the regent Bayram Khan pursued a vigorous policy of expansion on Akbar's behalf. As soon as Akbar came of age, he began to free himself from the influences of overbearing ministers, court factions, and harem intrigues, and demonstrated his own capacity for judgment and leadership. A workaholic who seldom slept more than three hours a night, he personally oversaw the implementation of his administrative policies, which were to form the backbone of the Mughal Empire for more than two hundred years. He continued to conquer, annex, and consolidate a far-flung territory bounded by Kabul in the northwest, Kashmir in the north, Bengal in the east, and beyond the Narmada River in central India—an area comparable in size to the Mauryan territory some 1,800 years earlier. Akbar built a walled capital called Fatehpur Sikri (Fatehpur means town of victory) near Agra, starting in 1571. Palaces for each of Akbar's senior queens, a huge artificial lake, and sumptuous water-filled courtyards were built there. It incorporated the tomb of the Sufi saint, whom he revered, Shaikh Salim Chisti (1418-1572), who had predicted the birth of his son. The city, however, proved short-lived, with the capital being moved to Lahore in 1585. The reason may have been that the water supply in Fatehpur Sikri was insufficient or of poor quality, or, as some historians believe, that Akbar had to attend to the northwest areas of his empire and therefore moved his capital northwest. In 1599 Akbar shifted his capital back to Agra, from where he reigned until his death. Akbar adopted two distinct but effective approaches in administering a large territory and incorporating various ethnic groups into the service of his realm. In 1580 he obtained local revenue statistics for the previous decade in order to understand details of productivity and price fluctuation of different crops. Aided by Raja Todar Mal, a Rajput king, Akbar issued a revenue schedule that the peasantry could tolerate while providing maximum profit for the state. Revenue demands, fixed according to local conventions of cultivation and quality of soil, ranged from one-third to one-half of the crop and were paid in cash. Akbar relied heavily on land-holding zamindars. They used their considerable local knowledge and influence to collect revenue and to transfer it to the treasury, keeping a portion in return for services rendered. Within his administrative system, the warrior aristocracy (mansabdars) held ranks (mansabs) expressed in numbers of troops, and indicating pay, armed contingents, and obligations. The warrior aristocracy was generally paid from revenues of nonhereditary and transferable jagirs (revenue villages). An astute ruler who genuinely appreciated the challenges of administering so vast an empire, Akbar introduced a policy of reconciliation and assimilation of Hindus (including Maryam al-Zamani, the Hindu Rajput mother of his son and heir, Jahangir), who represented the majority of the population. He recruited and rewarded Hindu chiefs with the highest ranks in government; encouraged intermarriages between Mughal and Rajput aristocracy; allowed new temples to be built; personally participated in celebrating Hindu festivals such as Deepavali, or Diwali, the festival of lights; and abolished the jizya (poll tax) imposed on non-Muslims. Akbar came up with his own theory of "ruler ship as a divine illumination," enshrined in his new religion Din-i-Ilahi (“Divine Faith”), incorporating the principle of acceptance of all religions and sects. He encouraged widow re-marriage, discouraged child marriage, outlawed the practice of Sati (widows committing suicide on their husband's funeral pyre), and persuaded Delhi merchants to set up special market days for women, who otherwise were secluded at home. By the end of Akbar's reign, the Mughal Empire extended throughout most of India north of the Godavari River. The exceptions were Gondwana in central India, which paid tribute to the Mughals, Assam in the northeast, and large parts of the Deccan. In 1600, Akbar's Mughal Empire had revenue of £17.5 million. By comparison, in 1800, the entire treasury of Great Britain totaled £16 million. Akbar's empire supported vibrant intellectual and cultural life. A large imperial library included books in Hindi, Persian, Greek, Kashmiri, English, and Arabic, such as the Shahnameh, Bhagavata Purana and the Bible. Akbar sought knowledge and truth wherever it could be found and through a wide range of activities. He regularly sponsored debates and dialogs among religious and intellectual figures with differing views, building a special chamber for these discussions at Fatehpur Sikri and he welcomed Jesuit missionaries from Goa to his court. Akbar directed the creation of the Hamzanama, an artistic masterpiece that included 1,400 large paintings. Mughal rule under Jahangir (1605-1627) and Shah Jahan (1628-1658) was noted for political stability, brisk economic activity, beautiful paintings, and monumental buildings. Jahangir married Mehr-Un-Nisaa, a Persian beauty whom he renamed Nur Jahan (“Light of the World”), who emerged as the most powerful individual in the court besides the emperor. As a result, Persian poets, artists, scholars, and officers—including her own family members—lured by the Mughal court's brilliance and luxury, found asylum in India. The number of unproductive, timeserving officers mushroomed, as did corruption—while the excessive Persian representation upset the delicate balance of impartiality at the court. Jahangir liked Hindu festivals, but promoted mass conversion to Islam; he persecuted the followers of Jainism and even executed Guru Arjun Dev, the fifth saint-teacher of the Sikhs. He did so, however, not for religious reasons. Guru Arjun supported Prince Khursaw, another contestant to the Mughal throne, in the civil war that developed after Akbar's death. The release of 52 Hindu princes from captivity in 1620 is the basis for the significance of the time of Diwali to Sikhs. Nur Jahan's abortive efforts to secure the throne for the prince of her choice led Shah Jahan to rebel in 1622. In that same year, the Persians took over Kandahar in southern Afghanistan, an event that struck a serious blow to Mughal prestige. Intentionally, Jehangir set in motion the demise of the empire when he granted King James I's ambassador, Sir Thomas Roe, permission for the British East India Company to build a factory at Surat. Between 1636 and 1646, Shah Jahan sent Mughal armies to conquer the Deccan and the northwest beyond the Khyber Pass. Even though they aptly demonstrated Mughal military strength, these campaigns drained the imperial treasury. As the state became a huge military machine and the nobles and their contingents multiplied almost fourfold, so did the demands for more revenue from the peasantry. Political unification and maintenance of law and order over wide areas encouraged the emergence of large centers of commerce and crafts—such as Lahore, Delhi, Agra, and Ahmadabad—linked by roads and waterways to distant places and ports. Shah Jahan also had the famous Peacock Throne built (Takht-e-Tavous, in Persian: تخت طائوس) in Persian, with 108 rubies, 116 emeralds, and rows of pearls. The Mughals were very conscious of their dignity as emperors, and dressed and acted the part. 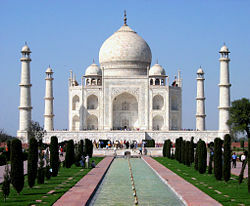 The world-famous Taj Mahal was built in Agra during Shah Jahan's reign as a tomb for his beloved wife, Mumtaz Mahal. It symbolizes both Mughal artistic achievement and excessive financial expenditures when resources were shrinking. The economic position of peasants and artisans did not improve because the administration failed to produce any lasting change in the existing social structure. There was no incentive for the revenue officials, whose concerns primarily were personal or familial gain, to generate resources independent of dominant Hindu zamindars and village leaders, whose self-interest and local dominance prevented them from handing over the full amount of revenue to the imperial treasury. In their ever-greater dependence on land revenue, the Mughals unwittingly nurtured forces that eventually led to the break-up of their empire. Establishing an elaborate court, with bodyguards, a harem and wearing expensive clothes, more and more tax revenue was needed merely to finance this lavish lifestyle. Meanwhile, the gun-power technology that had given them military superiority, which remained unchallenged within India, could be challenged from the outside by armies with more advanced technology. It was the greed and complacency of the emperors that resulted in their decline, and eventual demise. The last of the great Mughals was Aurangzeb. During his fifty-year reign, the empire reached its greatest physical size but also showed the unmistakable signs of decline. The bureaucracy had grown corrupt, and the huge army demonstrated outdated weaponry and tactics. Aurangzeb restored Mughal military dominance and expanded power southward, at least for a while. A zealous Muslim, Aurangzeb reversed the earlier policies that had helped to maintain good relations with non-Hindus, imposing Islamic law and dealing harshly with Hindus. He destroyed many Temples. Aurangzeb had the khutbah (Friday sermon) proclaimed in his own name, not in that of the Ottoman caliph. Aurangzeb defeated the British between 1688 and 1691, but their victory over the French at the Battle of Plassey in 1757 soon led to their controlling Bengal. From their original base in Serat, the British built forts and trading stations in Calcutta, Madras and Bombay (later the three Presidencies). In 1717, Furrukhsiyar would grant them a firman (royal dictate) exempting them from customs duties. The treaty of 1765 gave them the right to collect taxes on behalf of the emperor (the Diwani of Bengal). This virtually gave them control of the land, since taxation was linked to land ownership. Well before the dissolution of the Mughal Empire in 1857, the British system of District Collectors was firmly established. The District Collector remained the senior regional official throughout British rule. Aurangzeb was involved in a series of protracted wars: against the Pathans in Afghanistan, the sultans of Bijapur and Golkonda in the Deccan, the Marathas in Maharashtra and the Ahoms in Assam. Peasant uprisings and revolts by local leaders became all too common, as did the conniving of the nobles to preserve their own status at the expense of a steadily weakening empire. The increasing association of his government with Islam further drove a wedge between the ruler and his Hindu subjects. Contenders for the Mughal throne were many, and the reigns of Aurangzeb's successors were short-lived and filled with strife. The Mughal Empire experienced dramatic reverses as regional nawabs (governors) broke away and founded independent kingdoms. The Mughals had to make peace with Maratha armies, and Persian and Afghan armies invaded Delhi, carrying away many treasures, including the Peacock Throne in 1739, subsequently used by the shahs of Persia (Iran). Bahadur Shah I (Shah Alam I), born October 14, 1643, in Burhanpur, ruler from 1707-1712, died February 1712, in Lahore. Jahandar Shah, born 1664, ruler from 1712-1713, died February 11, 1713, in Delhi. Furrukhsiyar, born 1683, ruler from 1713-1719, died 1719 in Delhi. Granted the British East India Company customs exemption in Bengal. Rafi Ul-Darjat, ruler 1719, died 1719 in Delhi. Rafi Ud-Daulat (Shah Jahan II), ruler 1719, died 1719 in Delhi. Nikusiyar, ruler 1719, died 1719 in Delhi. Mohammed Ibrahim, ruler 1720, died 1720 in Delhi. Mohammed Shah, born 1702, ruler from 1719-1720 and 1720-1748, died April 26, 1748 in Delhi. Ahmad Shah Bahadur, born 1725, ruler from 1748-1754, died January 1775 in Delhi. Alamgir II, born 1699, ruler from 1754-1759, died 1759. Shah Jahan III, ruler 1760? Shah Alam II, born 1728, ruler from 1759-1806, died 1806. Ruled as a puppet of the British, granting them the Diwani of Bengali, Bihar and Orissa. Akbar Shah II, born 1760, ruler from 1806-1837, died 1837. Bahadur Shah II or Bahadur Shah Zafar, born 1775 in Delhi, ruler from 1837-1857, died 1862 in exile in Rangoon, Burma. By the mid-nineteenth century, the British were controlling vast tracts of the Mughal Empire and other principalities through a series of treaties and alliances. Technically, they still ruled as agents of the Mughal Empire, but were in practice exercising complete power. In 1853 they denied Nana Sahib (leader of the Marathas) his titles and pension, while elsewhere they refused to recognize adopted sons as legal heirs, and assumed power themselves. The Rani of Jhansi (1835-1858) was among those disillusioned with British policy in India when, following her husband's death, they refused to recognize her son as heir. Under what was called the “Lahore policy,” the British annexed any state over which they exercised influence if they considered its ruler decadent or if he did not have an heir whom they were willing to recognize. Between 1848 and 1856 they took over six states, causing considerable unrest. In March 1854, the British awarded the Rani an annual pension and ordered her to leave the Jhansi fort. Refusing to leave, she organized a volunteer army to oppose the regular Sepoy army of the British East India Company, which had British officers but mainly Indian troops. In 1857 a series of revolts broke out in the Sepoy army, fueled by rumors that the British intended to flood India with Christian missionaries and that pork and beef fat was being used to grease the new Enfield rifle cartridge. On May 10 the sepoys revolted at Meerut. They shortly captured Delhi and proclaimed Bahadur Shah II the emperor of all India. 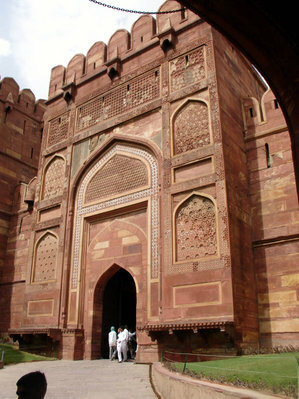 Agra was also taken, and the British residents retreated into the Red Fort. Lucknow also fell and the Rani of Jhansi emerged from the Indian side as one of the heroes, fighting the British dressed as a man. She was killed on June 18, 1858. Although Hindus as well as Muslims rebelled against the British and there was in fact considerable Hindu-Muslim solidarity at this time, they always blamed what went down in British history as the Indian Mutiny on Muslims, never really trusting them again. They argued that Muslims could not be loyal to the British because their allegiance was to a worldwide Muslim ummah. 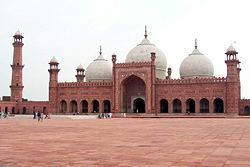 During the revolt, some Muslims called it a jihad, implying that they would not submit to non-Muslim rule but had a divine duty to struggle against infidel authority. The term "mutiny" is hardly appropriate, since the Mughal emperor was still sovereign and could not "mutiny" against his own lawful rule. However, Bahadur Shah II was found guilty of treason and banished to Burma. Queen Victoria was declared Empress of India, and Britain assumed direct control of its Indian possessions, winding-up the East India Company. They argued that Indians were unable to govern themselves properly, and continued their annexation policy removing "corrupt" Indian princes on a regular basis. India became the jewel in the British Empire. Technically, the title "Emperor" as used by British monarchs referred only to India, but popularly the term "empire" applied to all the British overseas territories and protectorates. By the early twentieth century, the whole of the subcontinent, including Sri Lanka, was under British administration, although many princely states remained theoretically independent. The Sikhs, who sided with the British, emerged as a valued and trusted community. For example, in the North West Provinces, where Muslims had been a dominant social group, before events of 1857-1858, Muslims occupied 72 percent of official government posts, including legal. By 1886 Muslims held only nine out of a total of 284 jobs, and it seemed that a long and glorious dynasty came to an inglorious end. The Mughal Empire was unprepared to deal with the threat posed by European intruders. It failed to maintain its military superiority. It imploded from within, as the emperors spent more time choosing which gorgeous costume to wear than they did attending to governance. Their predecessors, the Afghan Lodi Sultans had lost power due to indulgence. They failed to learn the lesson, and after a positive, prosperous start allowed their empire to deteriorate, losing its commercial edge and literally eating up its wealth. A few descendants of the last Mughal Emperor, Bahadur Shah Zafar, are known to be living in Delhi, Kolkata (Calcutta), and Hyderabad, India. The majority of direct descendants still carry the clan name Temur (Temuri - the 'i' at the end indicating the word 'of,' hence Temuri meaning "of Temur"), with four major branches today: Shokohane-Temur (Shokoh), Shahane-Temur (Shah), Bakshane-Temur (Baksh) and Salatine-Temur (Sultan). In popular news jargon, Mughal or Mogul denotes a successful business magnate who has built for himself a vast (and often monopolistic) empire in one or more specific industries. The usage seems to have an obvious reference to the expansive and wealthy empires built by the Mughal kings in India. This page was last modified on 29 October 2018, at 21:31.